The It Works Ultimate Body Applicator is a non-woven cloth wrap that contains an all natural, botanically-based formula on it. The ingredients in the lotion work to tone, tighten, and firm the skin. It also detoxifies your fat cells, causing 95% of people to see inch loss as well! You leave the wrap on for a minimum of 45 minutes (recommended for first time users), or as long as overnight if desired! You will see results when you remove the wrap, and progressive results after 72 hours! The Applicators (commonly called wraps) retail for $35 each, but you can purchase a 4-pack for $60 online when you sign up for the Loyalty program. It is meant to be used with the Defining Gel ($45 for 8 oz). You can apply the Defining Gel twice a day between wraps for better results. They encourage you to drink lots of water. Of course, if you eat right and remain active you will notice greater results. These aren't water wraps or compression wraps. It contours to one part of the body and allows the body to absorb the formula. Some of you may know that I am working on losing weight & toning up. I love trying new workout programs, since I get bored with one quickly. When I started my weight-loss journey, I had 12 month old twins and wanted to lose 100 lbs. Since then, I've lost about 20 and 2 pant sizes. I love seeing something that tells me what I'm doing is work (even if its much slower going than I would like), so when I heard about ItWorks I was very excited. When I received my order, I was so excited I actually forgot to do my pre-wrap measurements. I do know it was a little easier to squeeze into my capris the next day, though. When I was able to do my second wrap (you have to wait 72 hours between wraps), I took my measurements in 3 spots, as recommended. The top was about 2 inches above my belly button, where my “waist” sits. I also did my belly button and about 2 inches below it. I left the wrap on for a couple hours while I watched TV before bed. When I took it off, I remeasured. I lost 1/4″, 1″, and 0″ from the three measurements. I was pleased to see a slight difference and didn't expect anything more than that. My skin felt softer, too. Best part, I didn't do anything differently than I had been! I measured again 2 days later and found I have lost 1″, 1″, and 1 1/2″. Very impressive and explains why my shirt was laying a little nicer. At 72 hours, I had lost 2″, 1/2″, and 1″. I can't wait to do it again and see how much more I can lose. To learn more about It Works Body Applicators and their other great products, please visit their website. 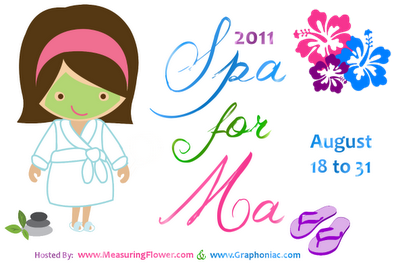 Staci (No More Baby Belly) is one of my sponsors for Spa for Ma! You can also connect with her via Facebook. Check back on August 18th for a chance to enter Savvy Shopper Central's Spa for Ma Pamper Pack, which will include a 1 oz sample of Defining Gel, an Ultimate Body Applicator, and a cute green tape measure, valued at $45.